Martin Scorsese once said that “The Age of Innocence” was the most violent film he had ever made. He was undoubtedly referring to the emotional torrents in the film, and, even though the film does not comes off as this totally perfect and touching romance, it still has many things to recommend it. Adapted from novel by Edith Wharton, the film pictures the 19th century New York’s delicate high society where manners and appearances take prime considerations. In the midst of it, lawyer Newland Archer (Daniel Day-Lewis) falls under the spell of the Europeanised and “exotic” Madame Olenska (Michelle Pfeiffer), finding himself in a love triangle, because he is soon to be married to the society’s belle, May Welland (Winona Ryder). Violent passions raging within the high-fenced societal constraints, almost tearing apart the delicate rules of order and innocence, is the film’s main theme. Kim at Tranquil Dreams and Drew at Drew’s Movie Reviews are hosting this great blogathon titled “Ultimate 90s”, and I have decided to write an entry on Tim Burton’s “Batman Returns” (1992). It will be fair to say that I was practically brought-up on this film and, in many ways, this film reflects my understanding and experience of the 90s decade. Check out my review on Kim’s blogathon page or read it below! Three years after directing “Batman” (1989), Tim Burton came up with yet another Batman film “Batman Returns”. Visually stunning and well thought-out, the film is about the rise to power of Oswald Cobblepot/Penguin (Danny DeVito), who has been hidden away and shunned by society for 33 years in the city of Gotham. In his quest to become the mayor of Gotham, Penguin is unwillingly helped by a dishonest businessman Max Shreck (Christopher Walken) as the Penguin’s freaky followers intermittently wreck havoc on Gotham to discredit the present mayor and eventually make it look like the Penguin is fighting crime. Meanwhile, Shreck’s shy secretary, Selina Kyle (Michelle Pfeiffer), finds out too much about Shreck’s illegal activities, causing Shreck to try to get rid of her, and the result of his efforts is Selina’s transformation into a Catwoman. Bruce Wayne/Batman (Michael Keaton) is also not indifferent to the crimes orchestrated by the Penguin and is determined to stop the Penguin and his gang while having a love-hate relationship with Selina/Catwoman. ‘A drowsy, dreamy influence seems to hang over the land, and to pervade the very atmosphere’ (Washington Irving, ‘The Legend of Sleepy Hollow’). 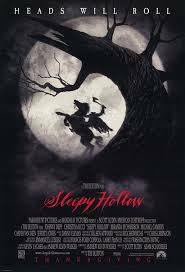 ‘Sleepy Hollow’ is Tim Burton’s seventh major film based on a short story by Washington Irving ‘The Legend of Sleepy Hollow’. The film is about Ichabod Crane (Johnny Depp), a young police inspector who, equipped with his progressive scientific expertise, arrives to a small village, Sleepy Hollow, filled with superstition and paranoia. There, Ichabod encounters old wealthy family, Van Tassels, who, like the rest of the village, is in fear of the Headless Horseman, who terrifies and commits gruesome murders in the village. Upon arrival, Ichabod promises to restore peace in the village and to discover the identity of the murderer. However, Ichabod is up for surprises as in order to complete his task he has to start questioning not only his scientific beliefs, but also matters of the heart, as he slowly falls for Van Tassel’s charming daughter, Katrina (Christina Ricci).